A complete simulation of another well known low cost European Airline. Product comes for Microsoft Flight Simulator X (FSX Steam Edition included) and for Lockheed Martin Prepar3D (All Versions) and offers you two planes in easyJet colors, a set of realistics missions chosen from the real timetable. Amsterdam, Prague, London, Belfast, Faro, Berlin, Venice, Madeira and more for a total of more than 40 different destinations. Beech Baron 58 combines the attractiveness of Beechcraft design with the reliability of twin engines, resulting in a gorgeous workhorse of an aircraft. In this rapresentation you will come across a complete and realistic simulation experience. General Aviation X is a collection of 3 products in a Special Super Bundle. In the 2013 we have released “Flying America” for Microsoft Flight Simulator X. 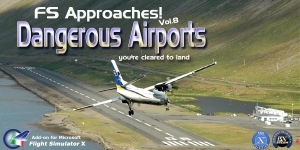 Product includes planes (in American Airlines livery) and missions over major Airports in the US. Now you can now expand your “Flying America” experience with a new and free mission. AA16 – Miami Intl to Princess Juliana Intl is designed for the free SGA MD-83 model, painted in “Copa America 2016” colours.